... read the whole story! Paintings all done. 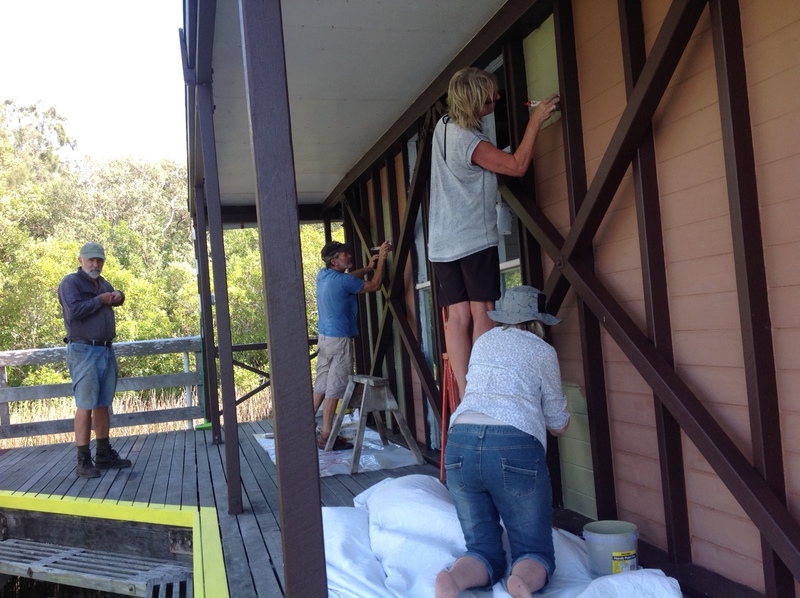 Our wonderful team of volunteers are back busy oiiling boardwalks, viewing room floor, cleaning accommodation area walls, and attaching awnings to restored toilet windows. Mayor Tony Wellington & councillors Frank Wilkie, Ingrid Jackson and Brian Stockwell being thanked by Charlie, for the Community Project Grant that purchased the outboard motor for the Kinaba Tinny. and if you have room on your boat for extra travellers, please contact Charlie, by Friday 11th November. Bring your picnic lunch, and tea, coffee and barbeque will be available all day. On Saturday 9th July, 80 people met at Kinaba to celebrate NICA's 20th year, FOK's winter picnic and a grand get-together to enjoy the building and surrounding area, and hear from John Olds, Steve Price, Tony Haslam and Ada Medak. Great speakers with great information at a great spot. Just a friendly reminder for you to let us know if you will be able to attend the Special Event Kinaba picnic in association with Noosa Intergrated Cathcment Association (NICA) on 9th July 2016. - not quite mission brown. An enthusiastic team of eight volunteerrs armed with hardware, tools and materials, put in a productive 5-8 hours painting the new corporate colours on the western & northern outside walls of the display area, and finished replacing the cross-bracing on the viewing room. A good day's work with great results. A great working bee replacing louvres, adding insect screens, and removing cobwebs, with guest worker Councillor Joe Juresevic assisting and enjoying the cameraderie and morning tea. A picnic with a difference. After tea coffee and breakfast, Steve, Kieran and Blair from Parks took us for a guided tour of the new upgrade to the Figtree Point camping and day-use area. It's worth a visit.